2014 was a very eventful year – both for Scotland and North Ayrshire. This community media project focused on promoting the wide range of events and activities that took place throughout the area. More importantly, we encouraged people and families in all communities to attend these events and document their experiences digitally. From gala days to music festivals and sporting events we called on everyone to go along, have a great day out and then tell their story online. By taking photos and videos and sharing them on free social media platforms such as Twitter, Facebook and Instagram using the hashtag #NA2014, we were able to collate everyone’s contributions to form an online digital archive of the year’s notable events. One of the highlights of the year was the day the Queen’s Commonwealth Baton visited 10 towns in North Ayrshire. 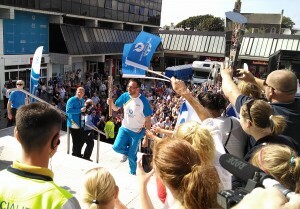 It was a warm and sunny July day and the crowds gathered in their thousands to catch a glimpse of the Baton as is passed through their community. We recruited volunteers to assist with our social media feeds and website updates as well as teaching image manipulation techniques and also created corporate volunteering opportunities.